SPACEPORT NEWSJanuary 22, 1999 Page 2 Two workers watch attentively above the first stage of a Boeing Delta II rocket as it is guided to its vertical position on the tower at Launch Pad 17A, Cape Canaveral Air Station. The rocket will carry the Stardust spacecraft into space for a close encounter with the comet Wild 2 in January 2004. Using a medium called aerogel, it will capture comet particles flying off the nucleus of the comet and will collect interstellar dust for analysis. The collected samples will return to Earth in a capsule to be jettisoned as Stardust swings by Earth in January 2006. Stardust is scheduled for launch on Feb. 6. Setting the stage for the launch of StardustA room with a view: Kennedy Space Centers Engineering Support Room Kennedy Space Centers new Engineering Support Room (ESR) in the Space Station Processing Facility is a room with a view. Specifically, the staff who work there have the long-range vision to support its astronomical goals. KSCs ESR is one of four rooms nationwide that lend support to the Flight Control Team at Johnson Space Center through its Mission Evaluation Room. With the dawn of construction efforts and eventual full-time habitation of the International Space Station (ISS), KSCs ESR is staffed 24 hours a day every day of each ISS mission, and ESR engineers are available on-call in between missions since ISS hardware is now on orbit. Due to the efforts of remarkably talented individuals, the ESR was activated in time to support STS-88 on-orbit activities, ESR Manager Jimmy Rogers recalled. KSC had about three months to pull together the resources necessary to establish an ESR. Computer networks and communication equipment were installed early enough to allow for proper training prior to the mission, and during STS-88, the KSC ESR was the only site to establish a means of electronic reporting to Houston. Kennedy Space Centers ESR began operations during the STS88 mission and will continue to support all station staging activities through final ISS assembly. The complexity of the InterWireless communications: when less is morenational Space Station requires multiple engineering disciplines, Rogers said. KSC is in a unique position to bring knowledge to the on-orbit process based on ground assembly and testing expertise. That experience proved to be invaluable for resolving two issues during the STS-88 mission. KSC ESR Boeing Integration Engineer Gary Wedekind recalls the details: JSC ground controllers wanted to start warming up the spacecraft using the interior lights and were not able to turn on Unity interior lights, Wedekind noted. This was due to the way in which it was (See ESR, Page 6)Working in the SSPFs Engineering Support Room, Jimmy Rogers (left) and Gary Wedekind review real-time temperature readings from Zarya and Unity on-orbit. The Stardust spacecraft test conductor is the first NASA customer at Kennedy Space Center to employ the use of the NASA-developed operational wireless voice system. Developed by NASA and Boeing expendable launch vehicle (ELV) engineers at Hangar AE at Cape Canaveral Air Station (CCAS), the system was recently adapted for use by payload customers processing spacecraft at KSC. The wireless headset was initially developed to support the activities of the NASA ELV flight commentator, Eric Anderson, to allow for improved mobility during ELV launches. We developed the system to allow the NASA flight commentator the freedom to cover the length of the telemetry lab unencumbered by a wire while he gathers data and reports on the vehicle and payload status during launch, said Martin Lougheed, lead NASA communications engineer for ELV missions. Now, the Stardust test conductor is using our wireless voice system to conduct processing operations with the Stardust Team. The system consists of a lightweight headset with microphone boom and a small belt pack. It replaced the formerly used standard headset attached to a five-foot cord. The system is the first of its kind at KSC and CCAS and works with the Eastern and Western test range voice communication systems as well as the KSC voice communications system. In addition to the NASA flight commentator, personnel in the NASA Pegasus Launch Site Support Trailer at Vandenberg Air Force Base in California are primary users of the system. 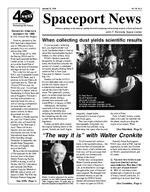 Page 4SPACEPORT NEWSJanuary 22, 1999 Walter Cronkite (center) chats with reporters at KSC Apr. 26, 1994, with then Astronaut Story Musgrave. Cronkite interviewed Musgrave as part of a special televised report on the space program.this opportunity. Q. In your opinion, what is NASAs greatest single accomplishment? A. I think the easy answer is landing man on the moon, but of course everything that went before and has come since are accomplishments for NASA. The entire package of the space program itself is the great accomplishment the business of originally getting man into space and then getting him to work in space and then getting him to another orbiting body out there. All of these things were accomplishments, but in the total, it is the package of what NASAs accomplished by exploring space that is the major accomplishment. Q. What would you suggest NASAs next space exploration goals be? A. I think NASA already has that pretty well in mind, and thats to see what we can do with Mars getting man to Mars and confirming the exploration of the unmanned vehicles and furthering that exploration. And then beyond that, as far as manned space goes, it will be the exploration of deep space. Q. If given the chance, would you accept an assignment to ride on the Shuttle? A. You bet! Im dying to go. If somebody would give me a shot at it, Id be there in a minute. Q. What were your thoughts when you saw John Glenn launch back in 1962 and how did you feel when you saw his launch in October? A. In we didnt know whether he actually would survive that flight or not ... We were hoping for the best ... and our hearts were riding there with Glenn and we were ... obviously very much concerned. With the Shuttle, there wasnt that concern about the success of the flight itself. It was mostly a trip into nostalgia, but worthwhile science without any doubt about it. Q. In the height of the space race and our race to the moon, did you ever expect that one day NASA would partner with Russia in building a space station? A. No, I must say, that was the farthest thought from any of our minds. The rivalry was intense at that time. It was indeed a race to the moon. We won it handily andCronkite ...(Continued from Page 1) 1999 ...(Continued from Page 1)Test (MEIT) is underway now to reduce the risk of anomalies on orbit. Soon, a second MPLM will arrive for testing, and ISS trusses will go into assembly, checkout and testing in the Operations and Checkout (O&C) Building. Yes, we did fill up the SSPF! The key to Shuttle/ISS missions in 1999 will be the launch of the Russian Service Module planned for mid-summer. Everyone will be watching for that crucial event. When it arrives on orbit, we will need to move prudently but swiftly to launch the four missions that end with the U.S. Laboratory on orbit in early 2000. Then we can get down to business with research on the ISS while we continue the construction jobs for a few more years. In addition to the ISS, we have a lot of other exciting development projects for 1999. There isnt room to even list them all in this article. Let me mention a few to indicate the scope of KSCs participation in NASA technology. Our Checkout and Launch Control System Team will be rolling out quite a few significant deliveries to include the Shuttle Data Center in March, the Atlas software for the Hypergolic Maintenance Facility in June, a ribbon-cutting for the Operations Control Room-1 (OCR-1), populated with consoles, in September and the Titan sofware for command functions and systems software in December. Our Integrated Vehicle Health Management (IVHM) Team will fly their second experiment on the Shuttle in May and begin work on the Future-X IVHM project, which they won this year. We will make final deliveries on all the KSC support for the X-33 and X-34 programs before test flights begin in 1999. We will begin construction this year of a new laboratory facility for the cryogenics testbed and hope to win final approval to construct the Space Experiment Research and Processing Facility (Hangar L replacement). Major rollouts and ribboncuttings planned for 1999 include: a newly renovated Visitors Complex, which should complete this $100 million (non-appropriated funds) improvement effort; an enlarged and renovated fitness center in the O&C in March; a new software tool for managing critical skills for development projects, AdminStar, to allow employee interface with training administration; a Mars environmental chamber; a newly refurbished O&C vacuum chamber; and a reusable launch vehicle facility (Phase 1) on the Shuttle Landing Facility tow-way. We will put significant effort into our eight strategic focus areas that I addressed in Center Director Communication #26 and expect these to help us progress rapidly toward our vision of becoming a Spaceport Technology Center. With your help in 1999, we can have a better year than the great year that we had in 1998. Staying healthy, injury-free and mishap-free need to be the last words. Well be continuing our efforts to move to a stronger safety culture with additional training and focus. In addition, we are investing Joint Base Operations and Support Contract (J-BOSC) savings to accomplish safetyand healthrelated projects. We will be busy, but anyone can call time out to address safety. Lets all remember: Safety and Health First! the Russians threw up their hands and had to give up, but no, that we would be working together in this fashion, hardly! Its demonstrative, I think, of what can be done with hands across the sea, as it were, and now hands across space in bringing formerly unfriendly nations into an alliance to further science. Q. As a reporter, youve covered many other topics other than space exploration. Does anything come to your mind that tweeks your interest more than space? A. Certainly not in the sense of a story that one can predict and follow. The developments of a program of this kind is a very different kind of story. Here were following an expected trail and following the success of that mission, and it is a vastly different kind of story therefore and a very happy one to be able to report. Q. So this is probably one of your finest opportunities to cover the space program? A. I dont think theres any doubt of that. I think that any reporter whos lived through these years and has had the opportunity to cover this greatest of our scientific and technological achievements has to feel lucky. SPACEPORT NEWSPage 5 January 22, 1999 The Joint Performance Management Office (JPMO) will hold an Open House from 9 a.m. to 3 p.m. on Tuesday, Jan. 26, on the second floor of Hangar I Annex. The JPMO is the new joint Kennedy Space Center and 45th Space Wing organization staffed by NASA and Air Force personnel to manage the new Joint Base Operations and Support Contract (J-BOSC). J-BOSC provides base support services at KSC, Cape Canaveral Air Station and Patrick Air Force Base. The J-BOSC contract began on Oct. 1, 1998, and consolidates NASAs Base Operations Contract, formerly held by EG&G Florida, the Air Force Launch Base Support contract formerly held by Johnson Control, Inc., and 16 other contracts. All are welcome to stop by the new office and learn more about the J-BOSC contract and the JPMO office.JPMO Open House to be held Jan. 26 Once again its time to mark your calendars and submit your registration to attend an exceptional day of training designed to help you deal with the challenges ahead. Expand Your Horizon Invest in the Future is sponsored by the Space Coast Chapter of Federally Employed Women (FEW) and will be held on Wednesday, Feb. 10, with an encore presentation on Thursday, Feb. 11. Both sessions will be held at the Radisson Resort at the Port, in Cape Canaveral. Registration and a continental breakfast begin at 8 a.m., followed by a keynote address presented by Shannon Bartell, deputy director of Space Station & Shuttle Payloads. The morning session will consist of four workshops: Leadership Development Dr. Marc A. SeSimone, Sr. Managing Multiple Priorities Dr. Joan DeSimoneFEW invite many to training Problem Solving & Conflict Resolution Approaches for Dealing with Difficult People Dr. Ben Findley Realizing Your Potential: Making the Most of You Peggy Morrow After lunch, which is included as part of your registration fee, the same four morning workshops will be repeated in an afternoon session. At the seminars, you will have an opportunity to meet new people from Brevard County and KSC to expand your network. Complete registration packages have been delivered to all training coordinators. Contact your training coordinator to assure your opportunity to participate. Workshop selections will be honored in the order received so get your registration in early! For further information, please contact Clara Anderson at 6393154. Putting FIRST things Kennedy Space Center has made a commitment to host the 1999 southeast regional competition of For Inspiration and Recognition of Science and Technology (FIRST). The event, which will take place at KSC Mar. 4 through 6, is expected to bring more than 3,000 to the space center. FIRST is a non-profit organization that works to combine the efforts of high schools, universities, government, businesses and private industry by forming teams to provide students with a handson look at engineering and other professional careers. Twenty or more student teams will be testing their robots on a playing field at the KSC Visitor Complex. Teams will be provided with a kit of materials and have six weeks to complete the challenging task of designing, procuring, manufacturing, assembling and testing a robot that will compete in athletic-like tournaments at regional and national levels. Most of the teams will have major corporate sponsors, such as NASA, whose executive staff will be present at the event, General Motors, Chrysler, Xerox, Motorola, Johnson & Johnson and Baxter Health Care. Vounteers will be needed from Mar. 3 through 6 in areas such as the pit and the playing field. Escorts will also be needed.. We are excited about giving our community an opportunity to share its resources, knowledge and talents with these young people, said Center Director Roy Bridges. I encourage all NASA personnel, contractor personnel and the central Florida community to join together by providing your support to sponsor this event and ensure its success. If you wish to volunteer, call Pat Caroleo at 867-2622. Reflecting on GOESLoral workers at Astrotech in Titusville check trim tab deployment on the geostationary operational environmental satellite-L (GOES-L), the fourth of a new advanced series of weather satellites for the National Oceanic and Atmospheric Administration (NOAA). GOES-L was developed for NOAA by NASA and is scheduled for launch from Cape Canaveral Air Station aboard an Atlas II rocket in late March. John F. Kennedy Space Center Managing editor. . . . . . . . . . . . . . . . . Bruce Buckingham Editor. . . . . . . . . . . . . . . . . . . . . . . Susan Maurer Editorial support provided by Information Dynamics Inc. Writers Group. NASA at KSC is on the Internet at http://www.ksc.nasa.gov USGPO: 733-112/80023Spaceport News Spaceport News is an official publication of the Kennedy Space Center and is published on alternate Fridays by the Public Affairs Office in the interest of KSC civil service and contractor employees. Contributions are welcome and should be submitted two weeks before publication to the Media Services Branch, AB-F1. E-mail submissions can be sent to Susan.Maurer-1@ksc.nasa.gov SPACEPORT NEWSJanuary 22, 1999 Page 6 A drop of water clings to the chin of a horned grebe after surfacing from underwater in the Merritt Island National Wildlife Refuge. Grebes have a remarkable ability to control their specific gravity so that they can swim high in the water or almost submerged. Although grebes breed in freshwater marshes, each fall most of the American population move to the coast. Grebes are therefore thought of as saltwater birds. These grebes are rarely seen in flight; once on wintering grounds, they seldom fly, and they migrate almost entirely at night. This is the most common saltwater grebe in the East. Migrating south for the winter is just duckySpace Shuttle Update:The orbiter Columbia, destined for liftoff on STS-93 in mid-April, is targeted for rollover from Orbiter Processing Facility bay 3 to the Vehicle Assembly Building no earlier than Feb. 1. STS-93 will carry the Chandra X-ray Observatory (formerly AXAF), the most sophisticated X-ray observatory ever built. At 45 feet long, Chandra is the largest satellite the Shuttle will have launched to date. Chandra will observe X-rays from clouds of gas so vast that it takes light five million years to go from one side to the other, and the light from some of the quasars to be observed by Chandra will have been traveling through space for 10 billion years. ESR ...(Continued from Page 2)closed out for launch. KSC recommended to use the Shell heaters in place of the lights and that the crew turn on the lights during entry by depressing the SRCA switch. Also during the mission, Wedekind recalled, When the crew began securing the external cables, KSC engineers observed from video downlink that the APAS-to-APAS cables were not being tied down properly at the forward stovepipe support gusset, so they notified the JSC EVA team, which relayed the information to the crew. Both situations were successfully resolved due to KSC involvement. Each ESR site has specific experience upon which to call to help solve problems as they arise during and between missions. KSCs experience is based on hands-on processing of flight hardware, ground testing, closeout photo documentation, the Problem Reporting and Corrective Action System that documents anomalies, and other KSC-specific processing activities. Staffing requirements in the ESR will revolve around the specific needs of each mission. At present, the room is staffed by a NASA manager, a Boeing integration engineer and by personnel skilled in the specific engineering disciplines required to support particular on-orbit activities. These include electrical, mechanical, thermal, communications and tracking, data handling, life support, and other engineering requirements. During periods of ISS on-orbit construction, the ESR staff will be available to assess assembly activities, subsystem activation processes and anomaly troubleshooting. They also can help with identifying any trends that could result in degraded performance or system failures. Rogers praised the cooperative efforts among government and contractor staff, which includes NASA, Boeing and USA, in KSCs Engineering Support Room. NASA and Boeing staff provide primary engineering support, and USA provides orbiter system experts for support to systems directly related to the orbiter that may be affected by ISS activities. Once we get in the ESR, there is no delineation between who works for whom, Rogers said. We all consider ourselves KSC employees, and thats whats important. Similar ESR rooms are operating in California and Alabama. Additional ESR sites are planned in the United States, Italy and Japan. Putting forth a powerful imagePhotographer John Sexton, a former assistant and consultant to world-renowned photographer Ansel Adams, has made several visits to Kennedy Space Center to capture images of the uniquely powerful equipment, hardware and facilities here. Sexton returned to KSC the week of Jan. 13 to capture yet more photographs in the Space Station Main Engine Processing Facility and the Vehicle Assembly Building, among other facilities, to use in his upcoming book Places of Power. I am interested in the sculptural beauty that can be found in these objects a pure aesthetic, Sexton said. The design of these structures and interior spaces are not contrived to be visually engaging, but rather the function of the object dictates its form. Through my photographs, I hope to transport the view into these unusual and powerful spaces. Places of Power is scheduled to be available in the fall of the year 2000.